Characterised by swinging notes and lively improvisation, the The Jazz Age in the roaring 1920s saw deeply passionate musicians and vocalists sharing the stage, with names such as Ella Fitzgerald and Louis Daniel Armstrong in the spotlight as the genre's most legendary figures. Today in Singapore, there is a man who is taking this music genre to new heights—nurturing new passions and making its music accessible to people from all walks of life to enjoy. Music maestro Jeremy Monteiro, also known as Singapore’s King of Swing and the nation’s Cultural Medallion winner in 2002, has been at the forefront on Singapore’s music industry. Together with friends who share the same passion for Jazz, they established the Jazz Association (Singapore) (JASS) in 2016—a charity that acts as a hub for the country's jazz scene and supports budding jazz artists in their pursuit of the art form. This year, the association's biennial benefit gala dinner looks to Broadway for inspiration and promises an enchanted evening for all guests on April 5, at the Shangri-La Hotel. Naming the gala after hit tune, Some Enchanted Evening, from the 1949 Rodgers and Hammerstein musical, South Pacific, the evening celebrates what the lengendary songwriters have contributed to the jazz scene, which has seen their songs repeatedly covered by the likes of timeless jazz singers such as Frank Sinatra and Billie Holiday. To make things extra special, guests will be able to make song dedications for a charitable fee as a sweet gesture, to celebrate a special occasion, or to simply surprise their fellow company present at the gala. Serenading guests will be American vocalist virtuoso Kenny Washington and the King of Swing himself, with a special appearance by Singapore's most well-loved jazz singer, Alemay Fernandez, as they entertain guests into the night. On nurturing young talents, the association offers a local and overseas scholarship every year for musicians intending to pursue a Bachelor’s degree in jazz studies. “Most legendary jazz musicians did not have any formal education in jazz because it was previously unavailable. This is mainly because jazz legends were inventing or innovating the music. Some had classical training, like jazz trumpeter and co-innovator of bebop jazz, Dizzy Gillespie” explains Jeremy on the importance of an academic exposure to jazz music, as we engaged in an email interview. Speaking to the universal quality of jazz, the association has been in collaboration with Very Special Arts (VSA), a charity that works with students with disabilities through the arts. The joint effort has since culminated in two major events—VSA’s annual concert and showcase—each exemplifying the musical and performing talents of students with disabilities. “Our young students with disabilities listened to jazz music (many for the first time) and expressed their feelings into words. These words were developed into poems, which were then inspirations for the new compositions by Mr Weixiang Tan, JASS’ Associate Music Director and piano composer”, says Maureen Goh, the Executive Director of VSA. As we delve deeper into the importance of JASS in Singapore's musical landscape, Jeremy shares his two-cents on looking out for the next wave of young talents and exposure the association has brought them. Besides the provision of scholarships, how has the Jazz Association (Singapore) been a platform that’s imperative in shaping young musical talents in the country’s musical landscape? Jeremy Monteiro (JM) Through our youth orchestra JASSYO! and through including some of the youth members in the activities of the main orchestra JASSO, we offer young jazz musicians the opportunity to get vocational on the job training and the opportunity to work with seasoned professionals, both local and international. Jazz is best learned from other good practitioners so the opportunity to work with the professionals is very valuable to the youth and student musicians in my view. How is Jazz Association (Singapore) making jazz more accessible in a society such as Singapore? JM Although our main focus has been on helping to raise the levels of excellence in jazz, audience development, youth development and cultural diplomacy, we consider it very important to be involved with working with the underserved and bringing to music to communities where jazz can be a source of enjoyment and happiness. We worked in 2018 with Very Special Arts on two main programmes, a musical where our musicians, led by Associate Music Director Tan Weixiang and JASS scholarship recipient Dawn Wong performed with young people with autism and Down’s syndrome and another activity at the writers festival where we worked with poets from VSA to combine poetry with jazz music to accompany. Many were touched to see the meaningful and high-level performances with our collaborators from VSA. We intend to expand our activities with VSA this year and are also discussing collaboration with the groups. Do you think more Singaporeans have become more aware and have a deeper appreciation of the music genre since the establishment of JASS? JM It’s early days for us, about 2.5 years since we established. I think that the audience members and jazz fans should speak about this, but I would like to think that there has been more engagement with the public, especially at our outreach concerts at places like the National Library and the Singapore Botanic Gardens. 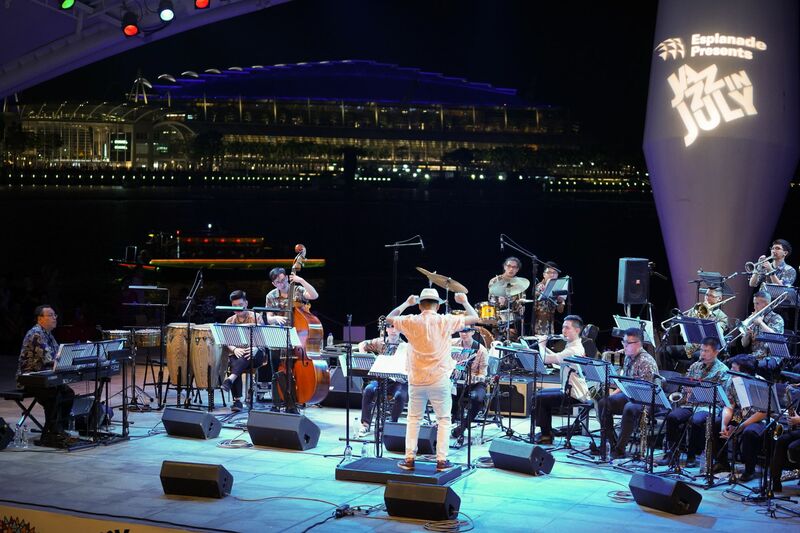 Do you think that Singapore's jazz scene is more widely recognised on an international level because of JASS? If yes, why so? JM Again, it’s early in our history, but in this short time we have performed at major international events such as the JZ Shanghai Festival, the EFG London Jazz Festival, the University of West London’s London College of Music and the recent Jazz Education Network Conference in Reno Nevada where we were invited to play at the JEN President’s Choice concert and where we were given and Outstanding Performance Award. Many people at this show came up to me and others to say, “I didn’t know that this level of jazz playing, particularly jazz big band playing, is available in Singapore”. So, I’d like to think that we are starting to be noticed.